To understand what is in your soil and what you will need to grow what you want, you’ll need to do a simple test first. Well mixed soil samples taken from the areas you intend to use. When we take soil samples, to get the best average results, we take them from several locations around our planned growing areas. To get good mixed sample(s) we dig in a few spots, to different depths with an average of 2-10 inches in depth. Then we can place amounts of the soil from separate locations into a clear glass or plastic container. Preferably with a lid. Samples need to be sufficient enough for you to see, so take about a 1/3- 1/2 by volume based on your container. Fill the container with clean, preferably distilled, water. Give the vessel a quick shake to mobilise the matter in the solution, a good stir will work. A lidded container ensures nothing else falls into the sample post mixing. But just covering it will suffice. Then place the vessel on a flat surface and wait for the particles to settle out. Typically the sand will settle first, then the silt, finally clays, which can take up to 24 hours. As each layer settles out, take a magic marker and draw a line to mark the top of the layer. These you will use later to measure the volumes using a ruler. After 24 hours, you should see layers have formed. Using the measurements, we use mm’s(millimeters) or cm(centimeters), you can calculate the volume percentages of your soil make up, so x% clay, y% sand and z% silt. So we can say our soil is 39% sand. We repeat this conversion for the remaining layers. 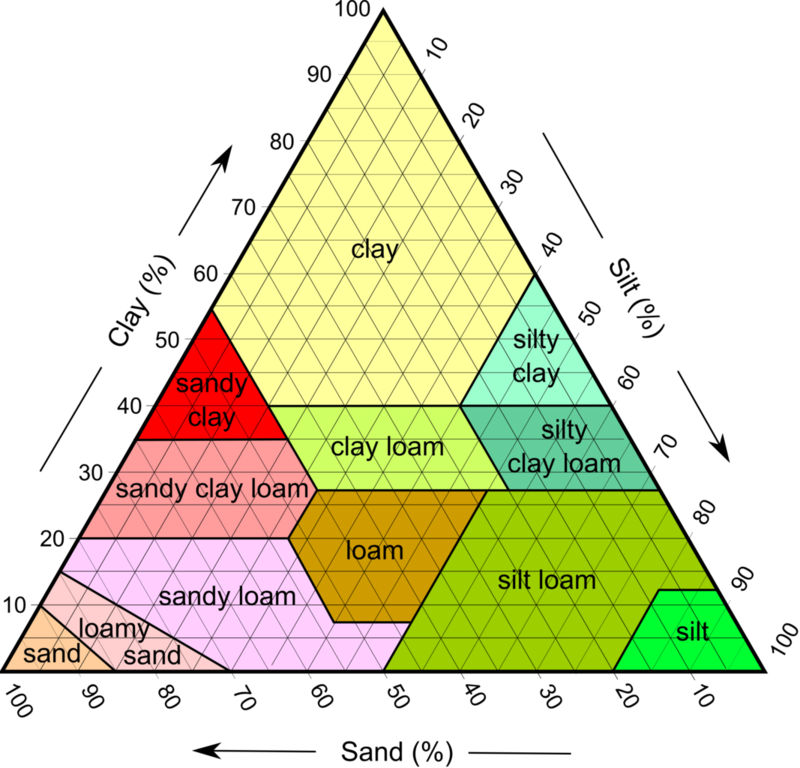 Now we have this information as a percentage, we can use it to determine our soil type by referencing it against the Soil Texture Triangle above. Once we do we can safely say we have X soil type and we can use this basic information to better plan for future planting success. If you don’t see layers, test again from another area. It may be you have only one soil type, although this is rare, it’s not impossible. Eg if you lived near the beach, it’s a high chance you would have lots of sand and little else right. The test is still a valid one, since it can tell you what you might need to add in, in order to offer future plants a home they can thrive in.